The Final Report is submitted to the Research Executive Agency. Publishable Summary can be downloaded here. The Marie Curie EU project CLOUD-TRAIN has been successfully finished on September 30. Final Reporting period started on October 1st. CLOUD11 Experiment has been launched at CERN. The conference was organized by Frankfurt University, coordinator of the EU project CLOUD-TRAIN. More than 70 scientists from France, Germany, USA, UK, Finland, Switzerland, Portugal, China, and from the European Research Organisation CERN took part in a vital discussion on the new results of the CLOUD experiment at CERN and challenges of modern aerosol research. "Ion-induced nucleation of pure biogenic particles" and "The role of low-volatility organic compounds in initial particle growth in the atmosphere" are the titles of the papers, which have been published in a scientific journal Nature on May 26, 2016, by the CLOUD collaboration team at CERN. 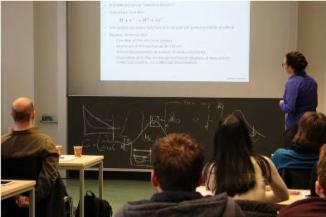 CLOUD-TRAIN fellow at TOFWERK Dr Sonja Klee initiated a mass spectrometry workshop at the Institute for Pure and Applied Mass Spectrometry (ipaMS) in Wuppertal, Germany. Sonja Klee:”The first Mass Spectrometry Fundamentals Workshop presented and organized by the Institute for Pure and Applied Mass Spectrometry (ipaMS) of the University of Wuppertal in collaboration with the EU-Project CLOUD-TRAIN and Tofwerk AG took place in the facilities of the University of Wuppertal from 14th to 18th of March 2016. Within these days 31 participants with a broad variety of background knowledge in the field of mass spectrometry – from students up to professors – had the chance to renew, widen or just discuss their knowledge in the fundamentals of mass spectrometry. The basic concepts of fluid dynamics, ion motion, matter and light, thermodynamics and kinetics cleared the way for the physical and chemical fundamental understanding of the functions within a mass spectrometric system. All steps from sampling via ionization and transfer up to the detection and data processing were included. Further the “MS practice” part offered the participants the opportunity to literally grasp the inside of a mass spectrometer and ask questions to different parts within those complex systems. During the CLOUD-TRAIN collaboration meeting (01 - 05.02.2016) in Hyytiälä (Finland) details of the training and research were discussed. This included planning for the CLOUD-TRAIN Open Conference in June, the experiences with the secondments at the industrial partners of the project were discussed, the status of the research projects was reviewed, preliminary results of the latest CLOUD experiments were presented, integrated analysis was coordinated and plans for further analysis and publications were defined. The CLOUD 10 experiment at CERN, took place from mid September to mid December 2015. - to study nucleation and growth for a range of parameters (especially temperature) to cover a large amount of parameter space needed as input for parametrizations for atmospheric aerosol modelling. CLOUD10 has been successfully finished on December 11. The results of CLOUD 10 will be discussed during a CLOUD-TRAIN Collaboration meeiting/Data Workshop in Hyytiälä, Finland, in February 2016. 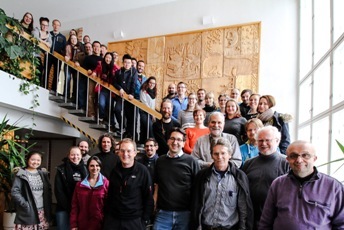 From 21 to 23 October, 2015, the CLOUD community met for a CLOUD-TRAIN Collaboration meeting and a Data Workshop at CERN. One of the important discussion points was the progress with the joint publications of the scientific papers, based on the results of CLOUD experiments. Neil Donahue (Carnegie Mellon University, USA) chaired the session devoted to this part of the agenda. The ongoing CLOUD experiment was discussed in a real-time mode, quick-look results were presented and plans for the upcoming measurements were discussed and revised. Joachim Curtius (Goethe University Frankfurt, Germany, coordinator of CLOUD-TRAIN) reported the status of the project, its progress and forthcoming tasks. One of these tasks will be organising the CLOUD-TRAIN Open Conference in June 2016, which will be focused on organic aerosols. Working Groups presented their acheavements and reported how the team work is organised within the groups. The EAC 2015 (European Aerosol Conference) took place in Milan, Italy, September 6-11, 2015. CLOUD-Collaboration has been represented by a large number of participants. Young researchers of the CLOUD-TRAIN project presented talks and posters. Alexander Vogel, one of the CLOUD-TRAIN fellows at CERN, chaired together with Yoshi Linuma the session "Secondary Aerosols 2" on Monday, September 7. Claudia Fuchs, the CLOUD-TRAIN young researcher at PSI, was awarded with "Best Poster Award" for the work "Secondary organic aerosol formation during aqueous phase processing in the CLOUD chamber at CERN "
The Smoluchowski Award for 2015 has been conferred to Andreas Kürten by the Gesellschaft für Aerosolforschung (GAeF) during the European Aerosol Conference held in Milan, Italy, September 6-11, 2015. With this Award the large contribution of Andreas Kürten into the scientific results, obtained in CLOUD Experiments and reported in Proceedings of the National Academy of Science last year, was recognised. The 3rd CLOUD-TRAIN Summer School took place in Cascais, Portugal. The training event was organised by Frankfurt University. PIs of the project: Jasper Kirkby (CERN), Joachim Curtius (Frankfurt University), Armin Hansel (Ionicon), Urs Baltensperger (PSI), and Katrianne Lehtipalo (Helsinki University) gave talks and classes. The CLOUD-TRAIN management, as well as the recent CLOUD10-T experiment and the plans and preparations for the upcoming CLOUD10 campaign were discussed also. Associated Partners were represented by Antonio Amorim (Lisbon University), Antonio Tome (Lisbon University), and Doug Worsnop (Aerodyne). Neil Donahue (Carnegie Mellon University) and Rainer Volkamer (Colorado University) were invited to give talks and classes also. University of Lisbon was closly involved in the organisation of the Summer School. The programme of the Summer School covered a wide range of research topics. The evaluation of the summer school contents revealed that the sessions on scientific writing and on the further career development in industry or in academic research were evaluated as very useful by the majority of the ITN fellows at the current stage of the EU Marie-Curie project. Hotel Baia provided seminar rooms for the general sessions as well as additional seminar rooms for the small working groups. A tour to the historical part of Lisbon University included the Science Museum and the Botanic Gardens. The tour was informative and interesting for the participants of the Summer School. A recent CLOUD experiment at CERN was titled "CLOUD10-T", "T" is used for "Technical", as this was a technical run to test new instrumentation and to do preparatory instrument characterizations and calibrations for the upcoming CLOUD10 scientific experiment. CLOUD10-T delivered a large number of substantial details for improving the CLOUD10 experiment, which is planned for September - December 2015. New instruments from University of Frankfurt, University of Wien, and from CERN were tested. A Media Training Workshop arranged by the CERN press office was held at CERN on April 22, 2015. It covered topics how to interact effectively with the media including print, radio and TV. The fellows obtained insight how journalists and newsrooms operate. They learned about the expectations of journalists, how to handle interview situations and how to present complex scientific issues. The seminar was given by trainers from Inside Edge. Inside Edge specialises in highly bespoke media training for experts. They currently work with over 30 universities, institutions and Research Councils across Europe. Chris Jameson has extensive experience as a senior BBC network producer and reporter. For much of the last decade he has worked at BBC Radio 5 Live on a range of programmes and as a reporter based in Japan. He has produced several major set-piece broadcasts for the network and his programmes have won several Radio Academy Awards. Tony Prideaux is an experienced journalist, teacher and communications specialist. As a reporter he has worked extensively with the BBC and in commercial radio. Tony has undertaken training in colleges and universities and has held management positions within education and business. Leonid Nichman – CLOUD-TRAIN ESR at Manchester University is a winner of the 1st prize in the category GRAPHENE of the tenth "Students Venture Out in Enterprise Competition". All of the 15 Fellows of CLOUD-TRAIN participated at the collaboration meeting at Paul Scherrer Institut, Villigen, Switzerland. Intensive discussions within the 6 existing Working Groups, based on the PP-presentations of young researchers, contributed to the further successful development of the project. For opening new horisons and preparing the instrument testing experiment CLOUD-T at CERN in spring 2015 several "breaking out groups" have been established during the meeting. The achieved results have been presented to the CLOUD collaboration community. Joachim Curtius presented in his talk the status of the project Consortium Agreement and the schedule of the 3rd CLOUD-TRAIN Summer School. During an interactive discussion Fellows of the project reported about their secondments. Members of the CLOUD-TRAIN Supervisory Board discussed the implementation of the project and future plans. Between the 22nd of September and the 20th of November the ninth series of nucleation experi ments with the CLOUD chamber took place at CERN. CLOUD9 focused on a) liquid-phase cloud chemistry, b) ice formation and ice properties, and c) ion processes. The global aerosol model GLOMAP has been run to test the sensitivity of global CCN concentrations to new aerosol formation mechanisms that represent the new findings from the experimental measurements during CLOUD7 and CLOUD8. On the 29th of November Periodic Report for the first two years of the CLOUD-TRAIN Marie Curie project has been submitted to REA. 6 Working Groups, which have been established at the collaboration meeting in Manchester, presented their achievements at the CLOUD-TRAIN Collaboration Meeting at CERN. Early Stage Researchers of the project Claudia Fuchs, Emma Järvinen, Robert Wagner, Chao Yan, Kamalika Sengupta, and Jasmin Tröstl have been chosen as speakers of the working groups. The IAC 2014 (International Aerosol Conference) took place in Busan, Korea from August 28 to September 2, 2014. CLOUD-TRAIN collaboration was broadly represented at the conference. Young researchers of the Marie Curie project as well as the experienced scientists of the collaboration gave a number of talks and presented posters on the results of the CLOUD experiment at CERN. A Summer School "Formation and growth of atmospheric aerosols" took place at Hyytiälä Foresty Field Station, Finland, from August 13 to 22. The Summer School was organized by Markku Kulmala, professor of Helsinki University, one of the participants of the CLOUD-TRAIN project. Coordinator of CLOUD-TRAIN, professor of Goethe-University Frankfurt Joachim Curtius also participated in the Summer School. On August 14 he gave a talk entitled "Ion-Induced Nucleation". In the afternoon session he discussed with the students the rules of good scientific practice. Representatives of the Associated Partners of the Marie Curie project CLOUD-TRAIN Douglas Worsnop (Aerodyne Research Inc.) and Katrianne Lehtipalo (Airmodus Ltd.) gave talks on atmospheric mass spectrometry and instrumentation. Almost all of the fellows of the CLOUD-TRAIN project participated at the Summer School. On 27 March 2014, the University of Manchester hosted the CLOUD-TRAIN Mid-Term Review meeting. It started with a report of CLOUD-TRAIN Scientific Coordinator Joachim Curtius on the overall progress of the CLOUD-TRAIN project and achievements of the first 18 months of the collaboration. Each of the 13 CLOUD-TRAIN fellows gave a presentation on their research, their training program and their experiences as a Marie Curie fellow. In fruitful discussions between all Scientists in Charge, the representatives of the Associated Partners, the Fellows of the CLOUD-TRAIN project, the Project Officer G. Donini from the Research Executive Agency (REA), and the Scientific Reviewer Dr. J. Ingrin the status of the project, experiences with the ITN structures and potential needs for changes were discussed. Coordinator of CLOUD-TRAIN Joachim Curtius, and two of the Early Stage Researchers of the project Christina Williamson and Martin Heinritzi participated at the international conference, organized by the EU Marie Curie project SPOT-ITN. Joachim Curtius explained in his talk that substances emitted by plants under stress are probably of high importance for organic aerosol nucleation. The topics of the presentations of Christina Williamson and Martin Heinrtzi were: “Nano-aerosol concentration and growth rates” and “From plant emissions to atmospheric new particle formation” respectively. The CLOUD8 experiment at the CLOUD facility at CERN started on the 30th of September 2013 with the installation of instrumentation inside the thermal housing followed by a thorough chamber cleaning cycle and determination of background levels for sulfuric acid, sulfur dioxide, ammonia and various organics. During the first part of the CLOUD8 runs nucleation events were studied. The subject of investigation in the second part of the experiment was the formation of liquid and ice clouds at various temperatures. The CLOUD team including the PIs and the young researchers of CLOUD-TRAIN met at CERN, Switzerland, to discuss the progress of the project and the new scientific results of the ongoing CLOUD8 experiment. 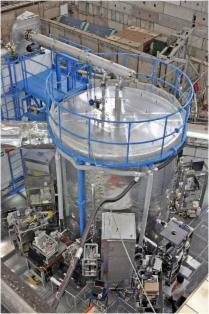 The CLOUD8 experiment is running from beginning of October to mid December 2013. Scientists from Finland, Switzerland, Germany, UK, Russia, Austria, and the USA were working together on the new challenges of the CLOUD experiment initiating adiabatic expansion runs where clouds are formed in the chamber. Ottmar Möhler from the Karlsruhe Institute of Technology chaired the session on the ice nucleation experiments. Ken Carslaw from the University of Leeds, a leading expert for global aerosol modeling, gave a talk on the complicated relationship between pre-industrial and present-day aerosol burden of the atmosphere. The scientific papers which are currently in preparation for publication were discussed. A paper "Molecular understanding of sulphuric acid–amine particle nucleation in the atmosphere" (Almeida et al.) has been published by the CLOUD collaboration team at CERN in the scientific journal Nature. “Thanks to CERN’s expertise in materials, gas systems and ultra-high vacuum technologies,” said CLOUD spokesperson Jasper Kirkby to the CERN press office, “we were able to build a chamber with unprecedented cleanliness, allowing us to simulate the atmosphere and introduce minute amounts of various atmospheric vapours under carefully controlled conditions – in this case amines and sulphuric acid." 15 young researchers of the CLOUD-TRAIN project and of the succesfully finished Marie Curie project CLOUD-ITN (among them the first author of the paper João Almeida) made their contribution to the scientific results, which have been published on October 6th, 2013. Read more in CERN press releases about the key discoveries made by the CLOUD researchers. 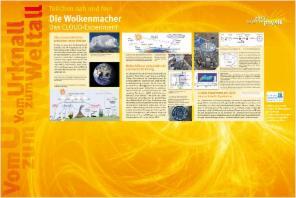 "Die Wolkenmacher" ("The Cloud-Makers") was the title of the presentation stand for the CLOUD project at the "Highlights der Physik 2013" in Wuppertal, Germany. In the exhibition selected achievements of physics were presented in German. 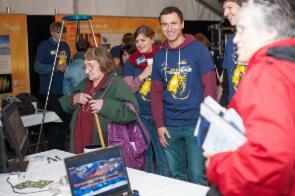 Posters, shows for a broad public, scientific discussions and science slams attracted more than 30 thousands of visitors, - informed the Medienbüro "Highlights der Physik". The participation of the CLOUD project in the exhibition has been prepared and realized by Frankfurt University, coordinator of the EU Marie Curie project CLOUD-TRAIN. Dr. Andreas Kürten and Markus Leiminger, a graduate student of Frankfurt University, explained general mechanisms of cloud formation and the goals of the CLOUD project at CERN to the visitors of the "Highlights der Physik 2013" exhibition. Karlsruhe Institute of Technology provided the small expansion chamber in order to visualize the cloud formation process. Markus Schauer, a graduate student of Wuppertal University was supporting the team from Frankfurt during the exhibition. 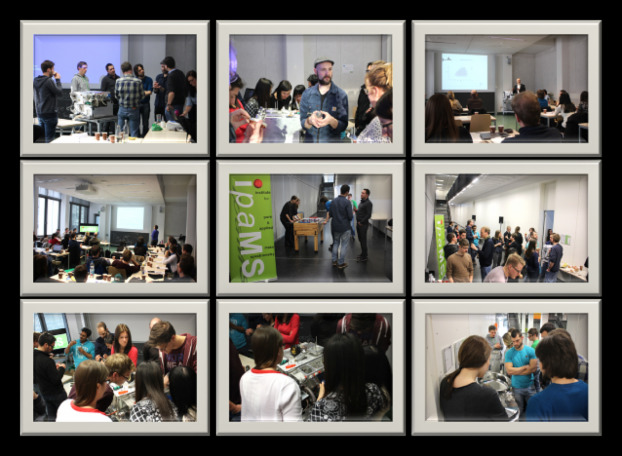 "Highlights der Physik 2013" has been organized by Federal Ministry of Education and Science (BMBF), the Deutsche Physikalische Gesellschaft (DPG), and University of Wuppertal, and was arranged by AC-Science-Consulting. A Summer School organized by TROPOS (Leibniz Institute for Tropospheric Research, Leipzig) and supported by CLOUD-TRAIN took place from September 8th till 16th 2009 in Braunfels, Germany. 24 students from all over Europe had the possibility to improve their knowledge in topics related to atmospheric aerosol, clouds, and atmospheric chemical processes. The young researchers could also upgrade their scientific writing and presentation skills. Following scientists from the CLOUD-TRAIN project gave lectures during the Summer School: Joachim Curtius (Goethe University Frankfurt, Germany), Jasper Kirkby (CERN, Switzerland), Frank Stratmann (IfT, Germany), Ken Carslaw (University of Leeds, UK), D. Wosnop (AERODYNE), M. Gallagher (University of Manchester, UK), U. Baltensperger (PSI, Switzerland), and A. Hansel (IONICON, Austria). Intensive meetings and sessions on CLOUD-TRAIN management took place parallel to the Summer School courses. The PIs of the CLOUD-TRAIN project met with the CLOUD collaboration community at the KTC Königstein, Germany, in order to discuss the progress of the project. Coordinator of the project Joachim Curtius from Frankfurt University introduced 6 young researchers, newly recruited for the CLOUD-TRAIN project, to more than 50 scientists from Finland, Switzerland, Germany, Sweden, Russia, Austria, and the USA. The obligations on the outreach of the project were discussed. Joachim Curtius informed all PIs that the ESRs should spend at least 1 day per year for outreach activities. Frank Stratmann from the Institute for Troposphere in Leipzig presented the schedule of the 2013 Summer School. The courses and core themes were discussed. An active discussion on how to help young researchers to participate efficiently in analysing the data and publishing the results was initiated by Jasper Kirkby. Jonathan Duplissy and Alessandro Franchin, young researchers of the CLOUD-ITN project (the EU Marie Curie Project which has been successfully finished in summer 2012) participated in the discussion. Between 1 October and 13 December 2012, the seventh series of nucleation experiments with the CLOUD chamber took place at CERN. The measurement campaign started with pre-conditioning (cleaning) the chamber followed by monitoring with PTRTOF. Dry air, water vapours, ozone, sulphur dioxide, and ternary species were added in stages into the chamber. For the first time nitrous acid, hydrogen, and alpha-pinene were used for the CLOUD chamber experiment. Ions in the chamber were produced by the CERN beamline. Various state-of-the-art instruments were operated for time resolved and comprehensive characterization of trace gases, ions, ion clusters and aerosol particles. 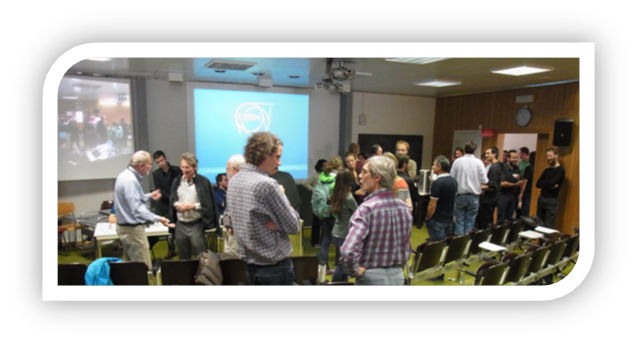 On October 15th, 2012, the Kickoff Meeting of the project took place at CERN, Geneva, Switzerland. Coordinator of CLOUD-TRAIN Joachim Curtius, professor of the Goethe University Frankfurt am Main, presented the figures of the EU Project CLOUD-ITN, which has been successfully finished in July 2012, and outlined the main items of CLOUD-TRAIN. The recruitment process has been discussed in details. Institutions, participants of CLOUD-TRAIN, have been invited to publish the job advertisements at the EURAXESS webpage as well as at national web pages such as http://www.findaphd.com/ etc. Joachim Curtius highlighted the role of gender aspects set out by the Grant Agreement of CLOUD-TRAIN.